After decades of failed initiatives to extend electricity access, over 600 million people in Africa still do not have access to electricity. With current trends, it will take until 2080 for everyone in Africa to have access to electricity. However, solar products are now sweeping the continent with creative distribution and business models. One innovative model is the Solar Kiosk, which has become the center of at least one rural community. Olekaramatian is a few kilometers away from the famous Lake Magadi. It is located in Kajiado County in the vast Rift Valley about 100 kilometers southwest of Nairobi. The solar kiosk has turned the lives of many residents in the area positively. Olekaramatian is a semi-arid remote region where power connectivity is poor. The area is yet to be connected to the national power grid, but the solar kiosk provides an example of how rural villages can ‘leapfrog’ conventional infrastructure. The solar kiosk serves as a life line to many residents of Olekaramatian, providing essentials that were not there for a long time. Residents were forced to travel for kilometers in order to buy perishable essentials like cooking fat, bread and wheat flour. These perishable essentials were hardly found in shops around since there was no adequate refrigeration due to lack of power. Besides stocking essentials the shop kept wild animals at bay because of the lighting at night reduces human wildlife conflicts. The Kiosk operates 24-7, making it a favorite meeting point. This has slowly turned the area in to an urban center since it has generated many other businesses such as bicycle repairs, tire repair, and recreation sites. Aside from selling essentials, the solar kiosk also sells other solar products such as solar torch that are selling like hot cakes since many people use them at night for lack of alternative source of lighting. Area chief Josphat Maiponyi say’s ‘’The solar kiosk has made the place become more hospitable just like Nairobi since we can get a cold soda and also shop at night just like Nairobi.’ Shop attendant Seuri Lesino on his part says he was forced to operate 24 hours a day after the demand of the essentials went up. Because of the demand, he is planning to distribute goods to other shops wholesale. Rachna Patel, Director of Berlin-based SolarKiosk says the Kiosk produces 2 kilowatts but her company can produce more power and can turn the kiosk into its own village. She notes that besides providing essential goods the solar kiosk has also been able to provide services such as printing and shaving, services that are being offered in the area for the first time. She adds that the solar kiosk company can also generate power that can feed other businesses in the area and also contribute to the national grid. She adds that there is a lot of potential of solar energy in remote areas that have not been connected to the national grid. The infrastructure has been a major challenge when setting up solar projects in remote areas in Kenya, according to Rachna. Her sentiments were echoed by Global Village Energy partnership advisory head Peter George who says infrastructure is still a challenge when setting up renewables in remote areas. George adds that the smaller, efficient and cleaner energy like the solar kiosk is preferable to larger projects such as hydroelectric dams because minimal space is used to set and operate. Peter adds that development will be only realized if there is efficient and adequate energy. 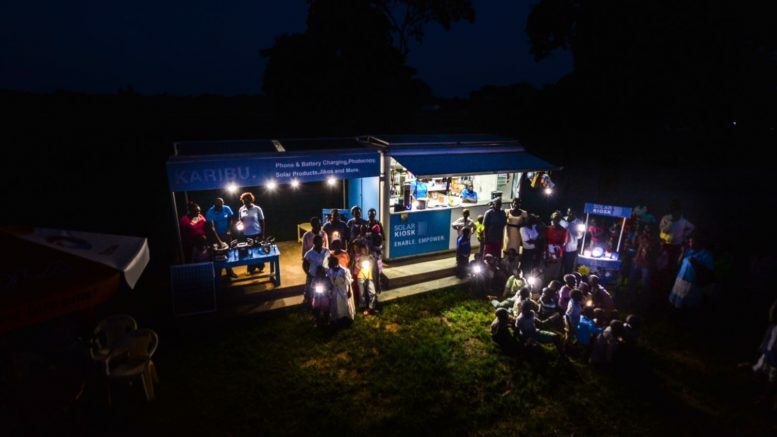 In Kenya, the solar kiosk is a new concept that is yet to gain ground but judging by the high number of households and areas not connected to the national power grid due to various factors including high connectivity prices; off grid solutions like solar kiosks can present a viable option to energy access. A majority of remote residents use paraffin as a source of energy and that has had negative effects on their health due to dangerous smoke emissions but with alternatives like solar residents can now have a variety of energy sources to choose from.